Thoughts on publishing. And Words? 105,297 of them. Pic unrelated, but I was proud of this pic I took (while writing outside) of a tiny spider. 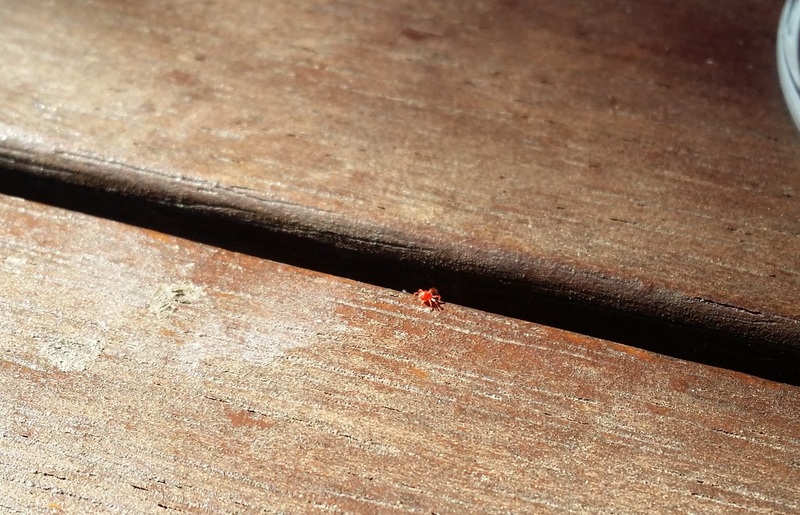 Guy is red like Spiderman, and about the size of a grain of sand. – Professional cover art (read as: paid talented artist, not your mate Bob with crayons). – Possibly put name of swanky editor on cover / in blurb, to let people know it has been extensively worked over. Find swanky editor and ply with bourbon. – Free deals upon release, with medium price point for the majority of time after that, because if I don’t value my work who will? I can do competitions for freebies later (woohoo!). – Author name taking up as much of the cover as the outer bounds of sanity permit, to create D.R.Sylvester brand / thingy. – Aim for five million downloads on publication day, to get a decent Amazon ranking. – Book trailer when I get around using Flash. – Free short stories section on blog (working on it). In other news, my hero just rode a very angry dragon into a hedge. I’m loving this whole writing thing. This entry was posted in Writing and tagged Planning, publishing, self publishing, spider, Writing. Bookmark the permalink. 12 Responses to Thoughts on publishing. And Words? 105,297 of them. Good plan, especially the plying an editor with bourbon bit. Let me know how that works out. 😉 You have the right idea for your cover work so far. Any plans for editing/first reading? If you’re looking for interested first readers, you can put me on the list! That’d be great! I think back at the start of July I mentioned the idea of an editing swap? Towards the end of September, when my 2nd re-write is done, I could maybe have an edit-run through your upcoming work (The Fount of Magic?) and you take a look at mine? I don’t know if I can post bourbon to wherever you are (the envelope would get all soggy), but I can certainly set a bottle aside for if you’re ever in Sydney, Australia! I’d be more than happy to read your work, as I liked the sample of Singer (waiting on my pay to buy the full article). Is that your first work? Yeah, I think short stories can help pave the way. That’s part of the reason I’m focusing on it now XD Agents read those literary magazine (the prestigious ones) sometimes looking for new talent. I can actually make a short story anthology after I’m done, or attempt to. I think getting published in a literary magazine is a lot easier than getting a novel published. And the great thing is is that if one short story doesn’t workout you can just write another one because they’re only about 5000 words not one hundred thousand. Yep, I struggle with writing more than one thing. I’m still editing and I can’t mentally start a new piece till I’ve gone through at least one edit on each one. It’s hard though, isn’t it? Because the best time to edit is once you’ve let your brain forget the piece a bit. Come back when it’s had time to ferment in its juices and such. Also I kicked myself hard a lot of times by doing fine tooth comb editing before I’d done the plot and story re-write, meaning I have whole chapters of beautiful prose that no longer fit the plot and have to be cut! Yep, I think you are right. I’m going to do a first edit and then let the stories sit for a while and come back in a month or two to edit again. Yeah, I just rewrote the intro for my suicide story and had to cut half of it XD With short stories it’s not as massive of an editing effort as it is for novels. I’m trying another critique site because I’m kind of iffy about the one I’m currently using. This new one has some really great writers too 🙂 They are password protected so it’s not considered publishing your piece online 😉 I feel like I can learn a lot from them so I’m trying to keep my mind open. I’m all in for the free short stories section. Nothing like a little teaser to get your audience engrossed. How do you plan on getting the number of downloads you want on publication day? – Announce the intended release date about a week out from the day. – Mention it in passing during each blog post that week, with a link to the original announcement post. – FREE to download, for at least the opening week or so. – Offer prizes for the first ten people who re-share my blog post, maybe a choice of cookies, shaped to the winner’s likeness, made by my wife (patissiere, so we’re talking shweeeet cookies here), or a personal haiku for that person? Or free hugs? – Categorise and tag so it pops up on the appropriate book categories in Amazon. – And finally, do a blog post to announce the actual release on the day, with similar prizes for re-shares. I’d be willing to do a lot more for book two when that’s done, because by that time I should have at least one published work to solicit highlights and interviews and blog swaps and stuff for. I think all of those steps will drive substantial traffic. However, I wonder about the possibility of getting so-called “trendsetters” to mention you in a blog post. Not necessarily sponsorship, but more like a “I’ll give you a free copy of my book if you mention me in a post” gig. That article pretty much sums up what I’ve suspected about the right way to go about things. My natural approach is to seek out like-minded people and show my support. The concept of spamming at the bigger fish for a leg-up is something that makes me feel… *hwoop* (sorry, just sicked up a little bit in my mouth there). That said, I don’t think I’ll be pals with our field-leaders for a good decade or so, if at all. – I am keen to showcase indie authors that I’m REALLY impressed by, but I don’t have the massive readership. – I can contribute to the blogs I love, sharing what I know and think with these leading bloggers, but I’m still learning the ropes after coming out of my writerly turtle-shell, and my contribution is limited. Basically, this is an awesome long term idea. I think for the short to medium term my plan is to try to find a community of other beginning writers like myself, that have a similar level of quality (and more importantly: work ethic) and give them my support. I might put a list of links to my favourite indie-writing people on one of my page tabs?